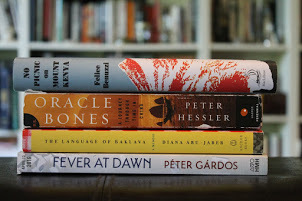 Yesterday I treated myself: I went to a poetry reading. 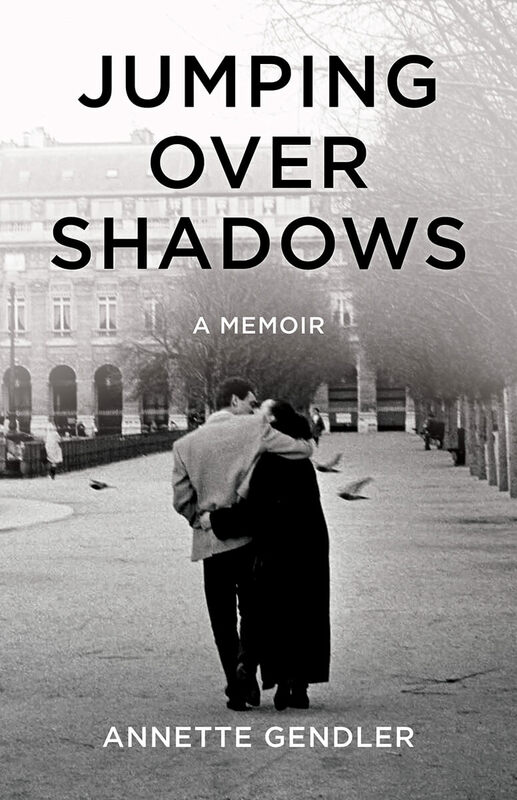 Normally, I am loath to schlep up to the north side of the city on a Sunday afternoon, but it turned out that my former student Marcia Pradzinski’s book release party happened during my son’s basketball game time, when I was schlepping anyway. It was meant to be! So I went and was rewarded with an enchanted afternoon interlude. I realized, once again, how uplifting art can be, and how much joy I get out of supporting a fellow writer, out of simply showing up. The party was held at the storefront studio of artists Beth Adler and Alice George, in a red brick building with twinkling lights strung in the tall windows and white-washed walls hung with canvases and all kinds of fun artist supplies sitting about. (No red wine on the printing press, please!) It reminded me how much I love hanging out in artist’s studios. They are a most inspiring place to be, perfect for a book release party. Turns out gracious hostess Alice George also runs the Serious Play Poetry Workshop, where a lot of Marcia’s work came to fruition. 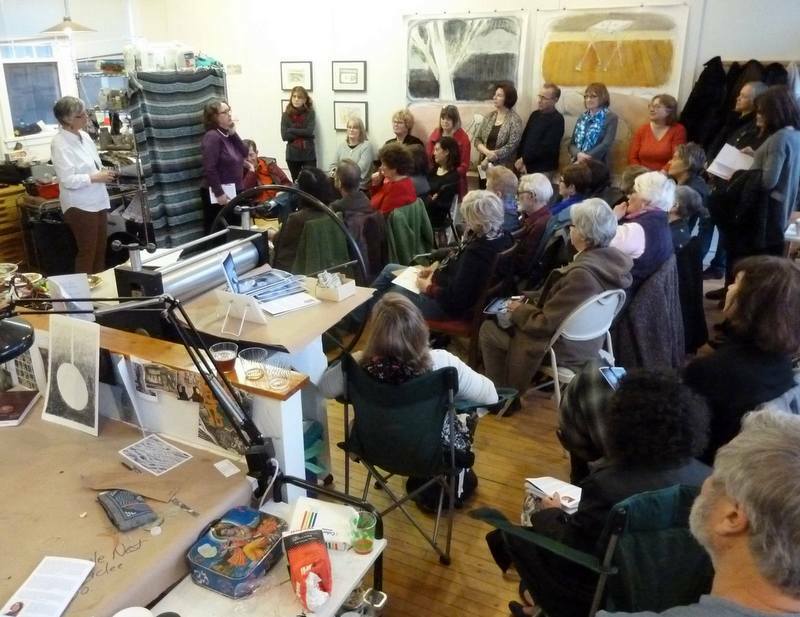 The studio was crammed with about fifty people, a nice crowd for a poetry reading, which was heartening in and of itself. It was good to be there to support Marcia, and I felt welcomed even though I didn’t know anybody else and there wasn’t that much time to socialize before the reading began, and afterwards I had to rush off to pick up my son. 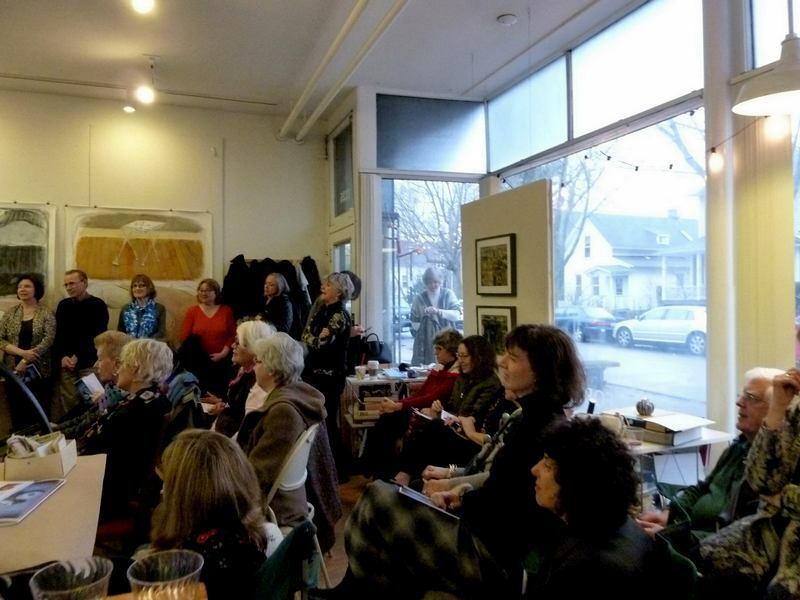 But in the interim, sitting among strangers in a light- and art-filled space, it was grand to sink into Marcia’s words, to meet again, in her poems, her son Adam, whom I knew from the memoir pieces she used to workshop in my class. If you’re into parenthood and family, love words, and appreciate how a few words can capture a lifetime, you will love Marcia’s poetry in Left Behind. Do yourself the favor and buy her chapbook, available at Finishing Line Press. You’ll support a wonderful poet while you’re at it, but really, you’re treating yourself. Marcia’s work is most accessible, exquisite and makes you wish you could muster that much attention to word choice, rhythm, structure, etc. that gave shape and structure to the fish. and a chat at the kitchen table. as he continues to stitch and clean me. at the birth of her grandson. Gail, thank you for taking nice pictures! 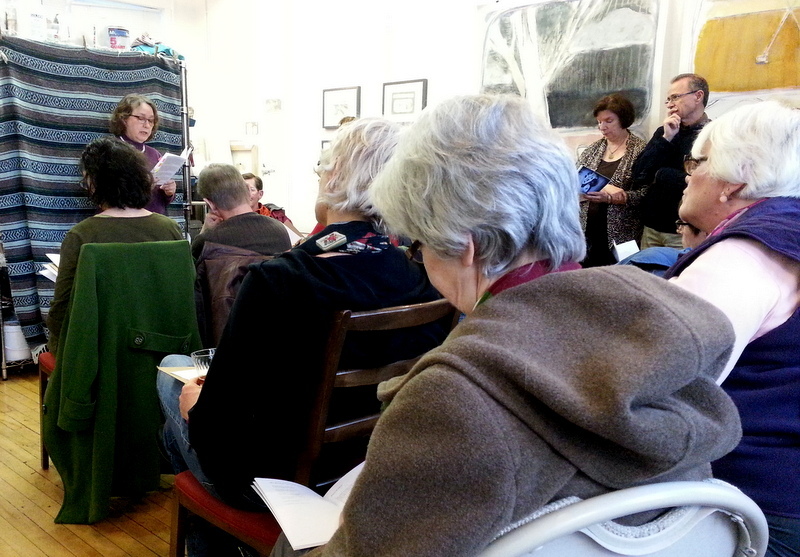 Quite a poem by Marcia, and it's good that people came out! I'm sorry I wasn't able to make it to Marcia's reading, but thanks for taking me there vicariously! I am working my way through her chapbook – not wanting to rush. Her poems are meant to be savored. Steph, happy to take you along virtually!